I’ve been shut out of the homemade ice cream party for too long, and I’ve been a little bitter about it. There are some great artisan ice cream shops nearby, but someone will tweet about their homemade black sesame ice cream and my toes will curl in excitement and then in jealousy. For one thing, I’m desperate for some black sesame ice cream, plus think of all the flavour possibilities. I want to play too, damnit. I didn’t think I could, since I don’t want to buy (or find room in my kitchen for) an ice cream maker, until I remembered the ice cream that doesn’t require one. The semifreddo. 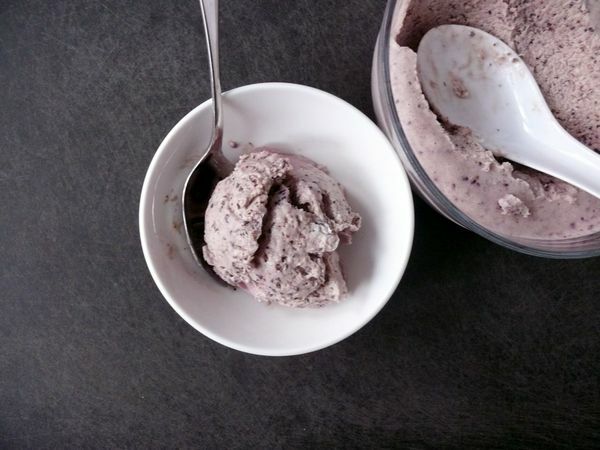 With a semifreddo (literally, “semi-cold”) you simply pour your mixture into a container, cover and freeze. It’s as delicious as ice cream and just as rich–even richer. You whip heavy cream and add it to your flavour and egg mixture (a sabayon) and freeze it. It creates a very mousse-like texture that doesn’t totally freeze. It’s somewhere between a mousse and softened ice cream, and its extreme richness will be the only thing saving you from eating a whole batch at once. But on to the flavour: blue-grey. 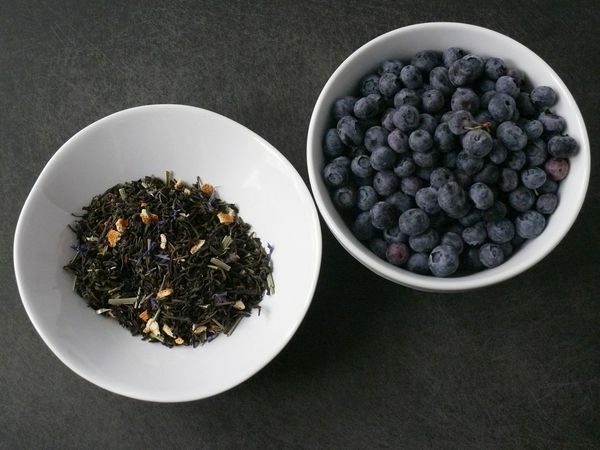 Blueberry and Earl Grey tea flavour, that is, just like a killer smoothie I ordered from tea shop near by. They customize fruit smoothies with any of their teas and that’s the combination I picked. 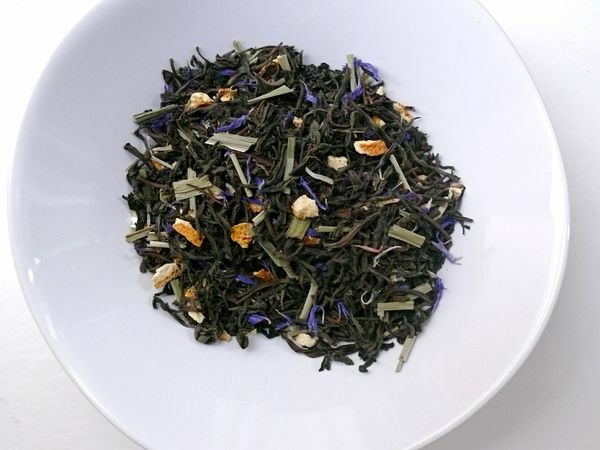 I loved it, but even more fragrant than Earl Grey, which is a black tea with bergamot (a type of orange) oil, are the spin-offs that also add Seville orange rind and various flower petals. My favourite is Russian Earl Grey which adds both orange and lemon rind, lavender petals or sometimes cornflower and lemongrass. The flavours compliment the blueberries so well in this semifreddo–subtle but present in every mouthful. Traditionally semifreddos are served as a terrine, and I did pour half of my batter into a rectangle mold to do the same. The rest I poured into a glass container with a lid to be scooped out just as you would ice cream. 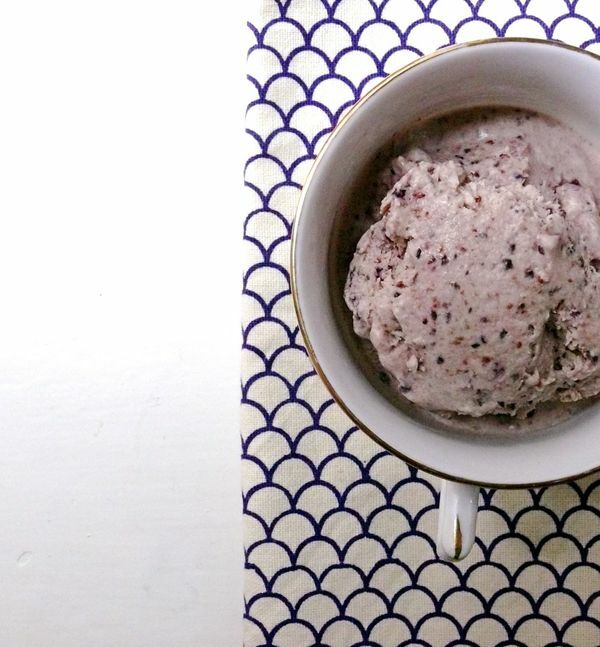 If you choose to do the same, you can serve this semifreddo in a cone, bowl, or, fittingly for this recipe, a teacup. Cute, huh? Too cute?? *If serving as a terrine, line a rectangular metal pan (approx. 9x5x3″) with 2 layers of plastic wrap, leaving generous overhang on all sides. You can also use a container with a lid that can fit in your freezer, for scooping out and serving the semifreddo in cones or bowls. Steep tea in 1/3 c boiling water for 20 minutes. Meanwhile, purée blueberries and 1/4 c sugar in a food processor until smooth. Set a fine-mesh strainer over a large bowl and strain blueberry puree into it, pressing to extract as much juice as possible. Discard the solids. Strain tea, discarding tea leaves. Add tea and vanilla extract to the blueberry mixture, stir well and set aside. Whisk eggs, salt, and remaining 1/2 c sugar in a medium metal bowl. Set bowl over a medium saucepan of simmering water (do not allow bottom of bowl to touch water). Beat egg mixture at high speed until it triples in volume and an instant-read thermometer inserted into mixture registers 170°, about 3 minutes. Remove bowl from over water and continue beating until thick and cool, about 3 minutes. Add the egg mixture to the blueberry mixture and fold it in just to blend. Beat cream in a large bowl until soft peaks form. Add to the blueberry and egg mixture and fold it in just to blend. Pout it evenly into your container for freezing, smoothing the top. Cover with a lid if your container has one, or lay a piece of plastic wrap over the surface of the mixture. 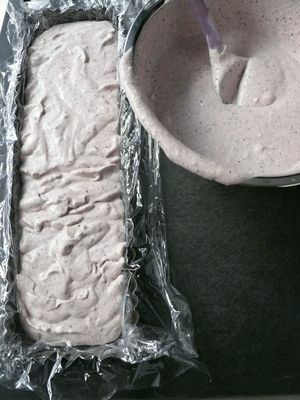 Freeze until firm, about 4 hours or up to 3 days before serving. 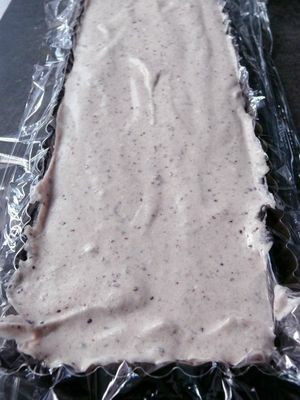 To serve, uncover semifreddo and if you used plastic wrap to line your pan, use the overhang lift it from the mold. Invert onto a chilled platter, peel off plastic and slice crosswise. Otherwise, scoop and serve onto a cone, in a bowl or teacup if you choose.